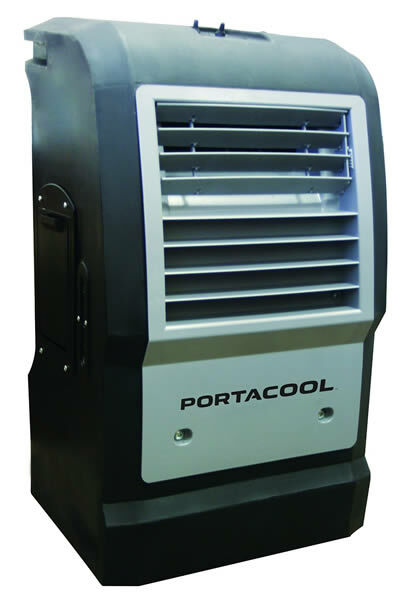 If you want real high power cooling without the expense of AC indoors or outdoors, this portable evaporative cooler from Portacool is totally for you! The PACCYC06 Cyclone cooler is a solid, high quality, USA built portable unit that is far superior to many of the foreign imports currently on sale at lower prices. Before you even start reading this review, be aware that it does cost more than other swamp cooler models on review here on this website so if you want a cheap cooler, this is NOT for you! I'm not trying to frighten anyone off because of the higher price ticket, but in truth, it's not all that much more expensive than comparable models from Honeywell or Kuulaire. What you get for an extra 50-100 bucks is real quality that you can feel as soon as you take this bad boy out of the box! Unlike other Portacool swamp coolers, this model actually looks pretty good. It has been modelled with a sleeker, more ergonomic design and smaller footprint despite its powerful cooling capability and large water reservoir capacity. It is rated for outdoor use, but works indoors just as well and will cool you down fast once you turn it on and set it to the high setting. 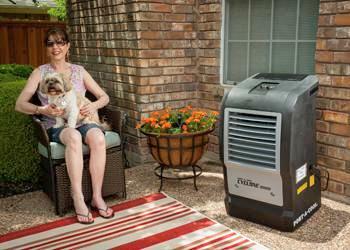 Designed for the patio, porch or pretty much any outdoor space where you need a blast of cool air on a hot day, this machine delivers as advertised and some! I have one running on my terrace at the back of the house blowing a lovely cool breeze at me and my family as we enjoy the sunny weather without having to suffer the draining heat. The great thing about this is when we are done outdoors and want to retire to the house to watch TV, I just wheel it in through the French doors and aim it at the center of the room. It cools the space down in a just few minutes and if I happen to be sitting in line with the cold wind it pumps out, I actually feel a little cold! Where can you get one of these bad, bad boys? I got mine from Amazon and they delivered it to my door the day after I ordered it. The price was lower than a LG portable AC with the same rating and it came complete and ready to use right out of the box. Here's the link to the page at Amazon if you want to get one for yourself, under the image on the left. You can read other customer reviews there and get all the technical specs if you're interested in that sort of thing, so I won't bore you by copying it all here. What I will do is summarize the features, benefits and other good points for your convenience so you can see at a glance what you'll be getting when you decide this is the cooler for you. One important point I must make: This is an evaporative cooler, NOT an air conditioner. It's important that you know the difference between the two. This unit works great in dry atmospheres. But if you live in an area with high humidity, it won't work so well and maybe you should go with a more expensive AC that will at least keep you cool and dry your moisture saturated air out too (if you have high humidity for most of the day/night). Here are some of the key features that make this model a must have cooler for the summer when you live in a dry climate (low humidity). As already mentioned, this device can be used indoors or outdoors, in the garage or workshop or anywhere you need some cool breeze. It needs a standard 110v electricity outlet (you can use an extension cord when operating it in the garden) and it uses so little power when compared with an air conditioner you'll wonder what's going on, if anything under the hood! I can tell you that under the hood, the entire process is super simple. The water in the tank gets soaked up by the evaporation medium (a porous, sponge-like sheet), the fan draws air in the back, forces it through the medium where the moisture is evaporated and chilled, then blasts the cold air out the front. That's about all that's going on inside the unit. Pretty simple, right! If you're still undecided, don't worry. You're not alone. Before I knew what these swamp coolers were, I had a big expensive AC running in the house and a big regular fan on the terrace, which was all but useless and just blew warm air at me. My electricity bill through the summer was through the roof and the last straw came a few years ago when I actually couldn't afford to pay it! I knew I needed a cheaper way to stay cool but for all I knew, everyone had AC or suffered in the heat. I didn't want to suffer because it gets so hot here in Colorado in summer. The breakthrough came when a neighbor told me about this strange cooler he'd just bought that didn't work like an AC, used under 200 watts of power and was as cool as his old AC that broke down. It was an older Portacool model and when I saw it, I was just amazed (although it looked more like an Apollo space module than a cooler). I wanted one and when he told me how much he paid for his, I went right out and got one from the same hardware store he got his from. I still have that machine today, although it stays in the garage now, since I bought the newer model that looks much nicer. More like a regular portable AC, just without the refrigeration process and the high energy consumption. Well, that's pretty much all I need to tell you, I think. Go right ahead and click the link (or the image) above and check this baby out at Amazon for yourself. Really!